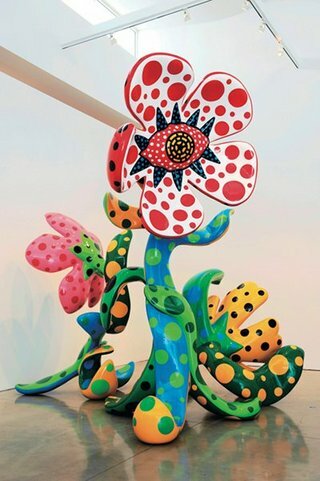 《FLOWERS THAT BLOOM AT MIDNIGHT》 ©Yayoi Kusama, Yayoi Kusama Studio Inc.
Born 1929 in Matsumoto, Nagano Prefecture. Lives and works in Tokyo. Started drawing pictures with polka dots and nets as motifs at the age of 10. Went to the USA in 1957, where she began to create large twodimensional works, soft sculptures, and environmental sculptures using mirrors and lamps among others. Returned to Japan in 1973. Participated in the 45th Venice Biennale in 1993.